Photos are available for media use on Flickr. Harrington, Del. 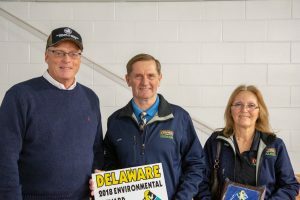 – Poultry farmers John and Linda Brown were recognized during Delaware Ag Week for their efforts to improve water quality and reduce nutrient runoff with the 2018 Delaware Environmental Stewardship Award. Coleman Organic division. Certified organic, the poultry houses have an attached area where the birds can spend the daylight hours and the houses are equipped with windows to let in natural light. Being environmentally friendly, the Browns harness solar energy to power the farm and utilize an electric car; woods provide a barrier against noise and odors; runoff is treated by a series of storm-water ponds; and all the houses and the manure shed have concrete pads, which are kept very clean. L&J Farm is a perfect example of a beautiful, neighbor-friendly farm. Ken and Nicole Wilkins of Felton, grow for Amick on a newer, picture-perfect farm that they named the “Funny Farm.” In 2015, they built three poultry houses on their homestead, along with a manure shed and channel composter. The storm water engineering includes a large storm-water pond to treat runoff from the production area. A screen of trees has been planted to assist in containing odors. Fly traps are used throughout the farm and near the composter to reduce these pests. Carol Johnson of Bridgeville, who grows for Allen Harim, raises 90,000 chickens and tills twenty-five acres on Loockerman Farm. 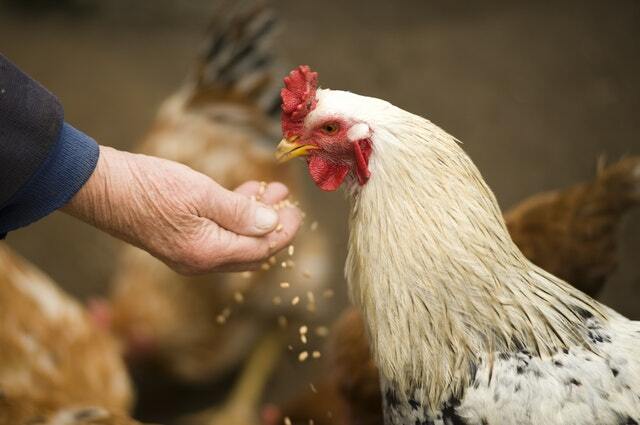 The farm has two manure structures, has heavy use pads installed on the poultry houses, and utilizes solar energy to help power the poultry operation. In addition, cover crops are utilized as a conservation practice on the cropland. Ms. Johnson has been a 4-H leader for more than 25 years.